After the cold and colorless winter, spring is a welcome sight. The bright and colorful flowers throughout the country create a stunning view at every turn. 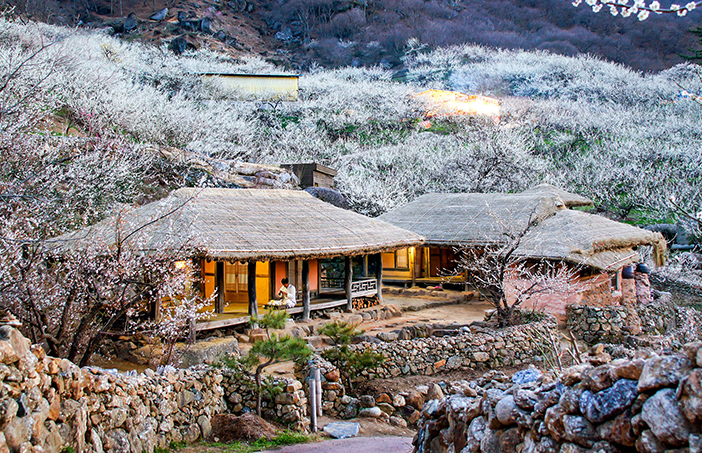 The sweet scent of blossoms permeates the air in both the heart of the city and the quietest of rural villages, making spring the best time to visit Korea. To make the most of this magical time of growth and renewal, read on to learn about the best places to visit. 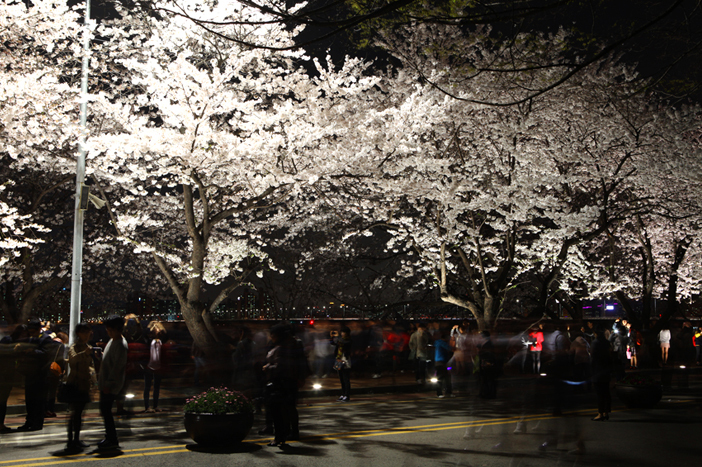 Yeouiseo-ro Road (formerly known as Yunjung-ro Road), located behind the National Assembly Building in Yeouido, is one of the most popular destinations for viewing cherry blossoms. As cherry blossoms begin to fully bloom in early to mid-April, the 1.7 kilometer path lined with 1,800 cherry blossom trees transforms into a snow-white tunnel, accented with forsythia and other spring blossoms, just in time for Yeongdeungpo’s Yeouido Spring Flower Festival. Traffic is restricted in certain areas of Yeouiseo-ro Road during the festival period, allowing visitors to enjoy the cherry blossoms to their hearts’ content. 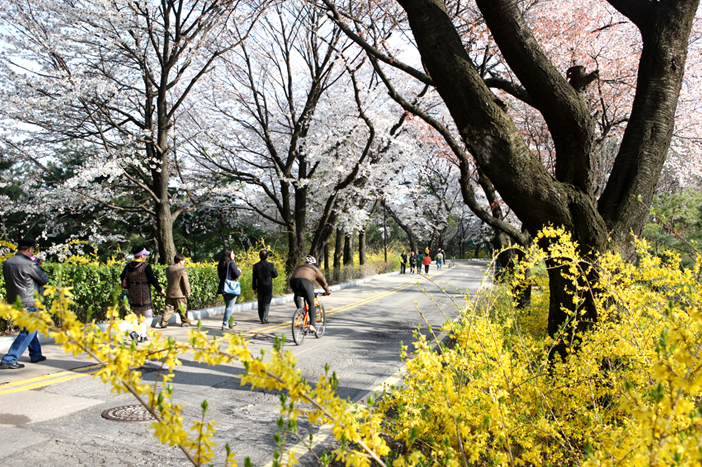 Namsan Park’s Circular Road, which connects Namsan Library, Namsan Octagonal Pavilion and the National Theater of Korea in Jangchung-dong, is a beautiful scenic route lined with forsythias, azaleas, and cherry blossoms. Although it stands at 262 meters above sea level, Namsan Mountain is a fairly easy walk and the blossoms make it that much more enjoyable. The walk begins from Namsan Library and takes about 40 minutes to reach Namsan Octagonal Pavilion located at the top of the mountain. 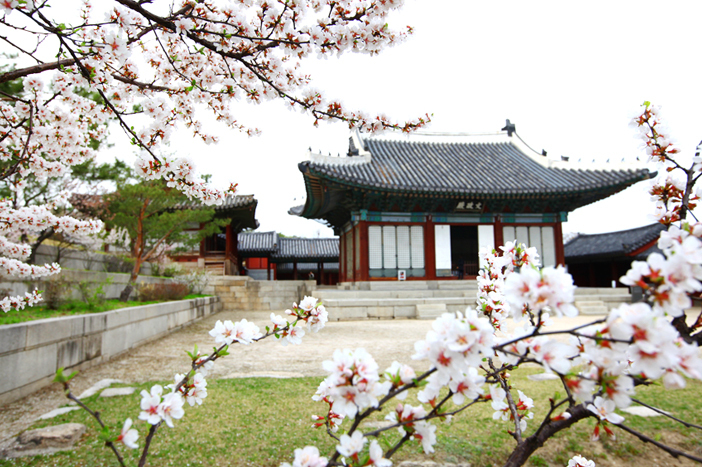 Changgyeonggung Palace, one of the major royal palaces in Seoul, is a prime spot to view cherry blossoms. The palace creates a gorgeous backdrop for photos made by an assortment of cherry blossoms, plum blossoms, Korean bush cherry, sansuyu (cornus fruit) flowers, apricot blossoms and royal azaleas as they bloom among ancient architecture in the heart of Seoul. From time to time, visitors can spot a fantastic shower of cherry blossom petals raining over Okcheongyo Bridge. 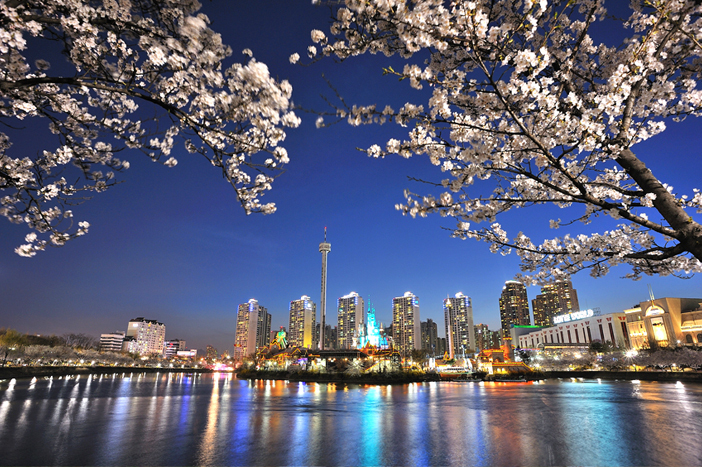 The Seokchonhosu Lake Cherry Blossom Festival is held every spring at Songpa Naru Park, a peaceful lake park that surrounds Lotte World. Seockhonhosu Lake boasts approximately 1,000 mesmerizing cherry trees lined up like a tunnel of flowers around the lake, creating a fascinating scene in spring. Lotte World’s Magic Island appears to float in the middle of the lake. The festival offers events and family-fun activities for a perfect day out at Seokchonhosu Lake and Lotte World. Ilsan Lake Park is home to a large number of flowering shrubs and trees, including thousands of cherry trees surrounding the lake. After the sun sets, lights strung around the trees create a romantic atmosphere as the cherry blossoms and lights reflect on the lake. Daytime visitors can enjoy a picnic on the large lawn carpeted with soft green grass. The annual International Horticulture Goyang Korea held nearby is also worth visiting, exhibiting flowers from all over the world. Icheon is home to a huge number of sansuyu trees. These wild trees, many over 100 years old, are spread all over the city and found most abundant in the Baeksa-myeon area, which is referred to as Sansuyu Village. 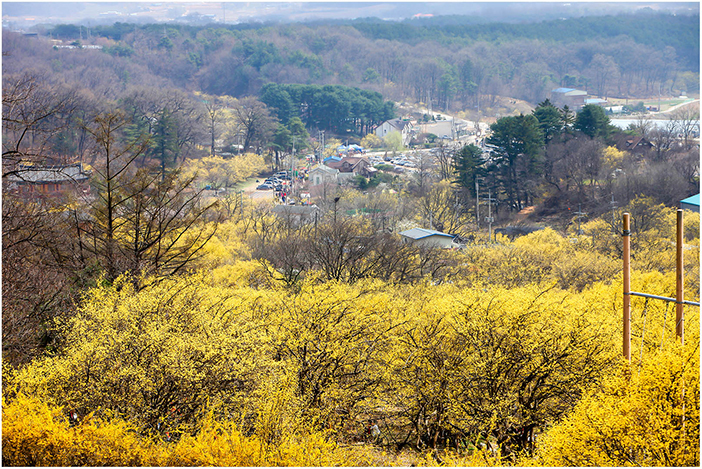 The Icheon Baeksa Sansuyu Flower Festival is held at this village every spring when the flowers bloom, coloring the village with vibrant yellow. In particular, walking paths are prepared within the village, offering a magnificent view to anyone willing to take a walk. The city of Jinhae comes alive in spring when Jinhae Gunhangjae Festival takes place and approximately 360,000 cherry trees begin to bloom. 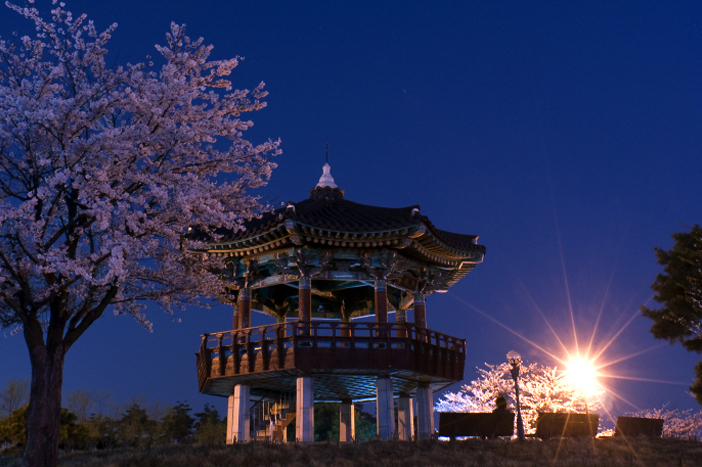 Although the entire city is considered one of the top cherry blossom destinations, the most popular flower viewing areas are Anmingogae Hill, Jehwangsan Park, and Yeojwacheon Stream. 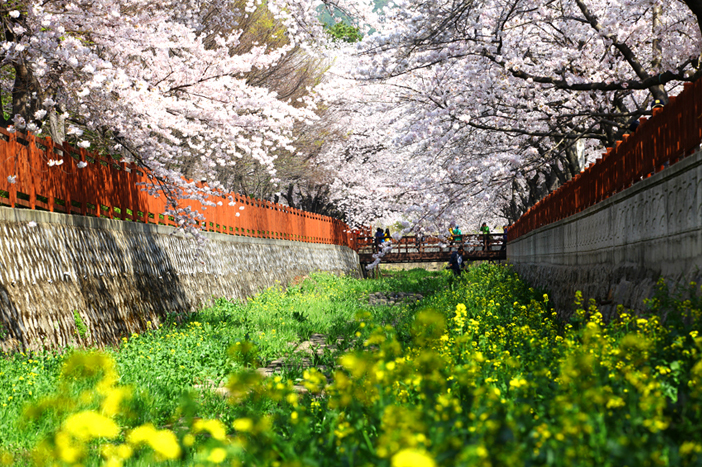 In particular, an approximately 1.5-kilometer long section of Yeojwacheon Stream is lined with cherry blossoms, creating a tunnel of white petals. The sweet scent of canola flowers under the cherry trees will accompany visitors as they walk through the floral tunnel. The Simni (10ri) Cherry Blossom Road is a 6-kilometer road that stretches from Hwagae Market to Ssanggyesa Temple in Hadong-gun, Gyeongsangnam-do. 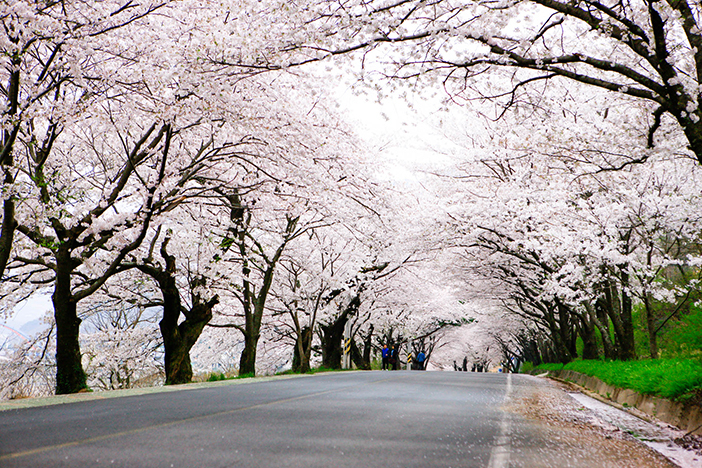 The road is often called the "wedding path" due to a belief that says couples who walk along the road when the cherry blossoms are in full bloom will fall deeply in love with each other. It’s easy to see why people might believe this when the seemingly unending tunnel of light pink blossoms unfolds before you. In addition, the annual Hwagae Cherry Blossoms Festival takes place around this time when the cherry trees are in bloom, offering more attractions for people walking the path. In Gwangyang Maehwa Village, near Seomjingang River in Jeollanam-do, plum trees start to blossom in early March, reaching their peak in the middle of the month. During the Gwangyang Maehwa Festival, large crowds of tourists from across the nation flock to the village. While plum flowers differ in color depending on the breed, most plum flowers found in the village are white. The flowers give the village a mysterious yet tranquil atmosphere, resembling a snow-covered wonderland in spring. Located about 19 kilometers south of Wando in Jeollanam-do is Cheongsando Island, part of the Dadohaehaesang National Park. Cheongsando Island was designated as the first Asian "Slow City" and is home to the world’s first “Slow Road” as recognized by Cittaslow International, an organization aimed at promoting cities that preserve traditions and culture within a natural environment. With the arrival of spring, yellow canola flowers grow abundantly on the island and their fragrance fills the air. With clear blue skies, turquoise sea, and bright yellow flowers, the island remains a favorite springtime filming location for movies, dramas and TV commercials. 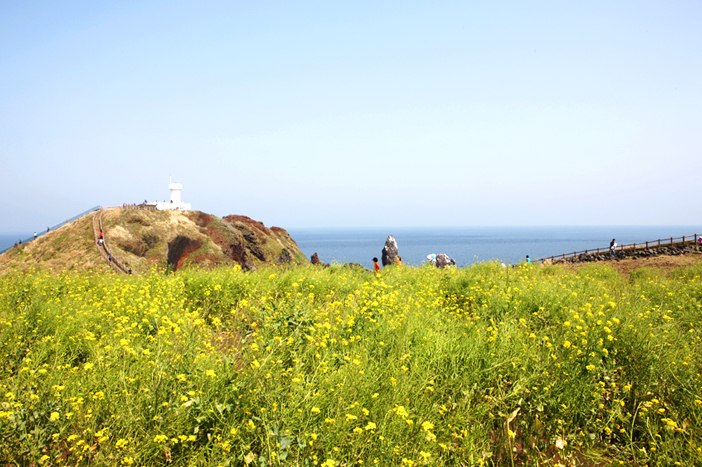 As Korea's southernmost land, Jeju Island is the first to see the blossoming of spring flowers, drawing in many tourists with the start of spring. 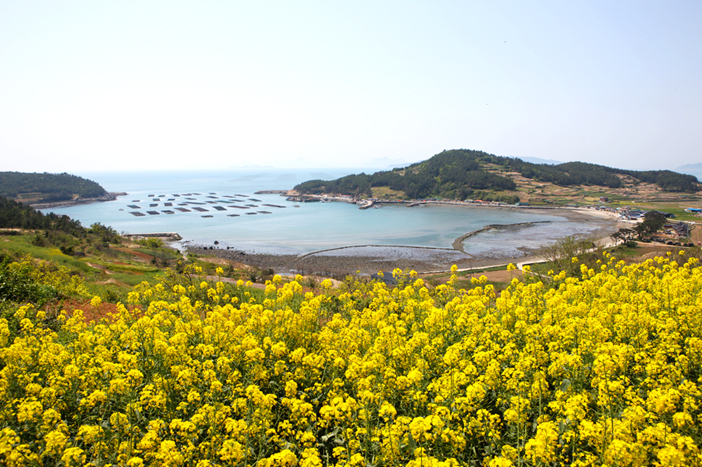 Yellow canola flowers spring up far and wide on the island, creating picture perfect scenery in places like Seopjikoji. The views of natural fields of canola flowers set before the deep blue ocean are amazing. Visitors will be pleased to find uniquely shaped sculptures set in fields of canola flowers for photos of their trip. Furthermore, some tourist sites offer pony rides, an activity especially popular among families with children. 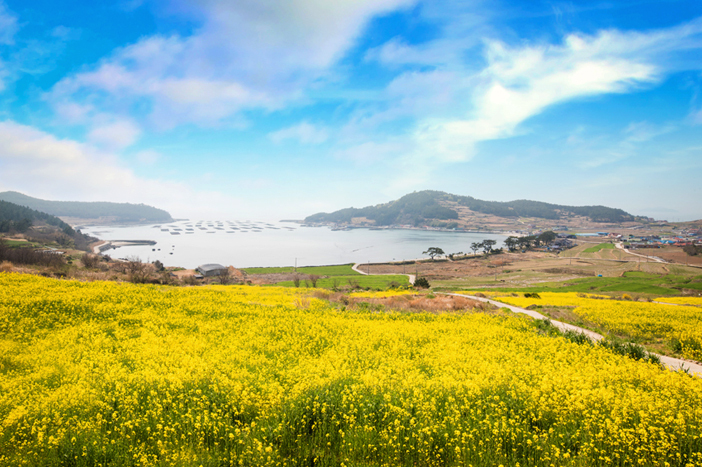 Famous for the surrounding blue sea and beautiful islands, Yeosu is another popular destination for viewing spring flowers. Starting in April, pink azaleas color the ridges of Yeongchwisan Mountain (Yeosu), creating picturesque scenes against the deep blue ocean. 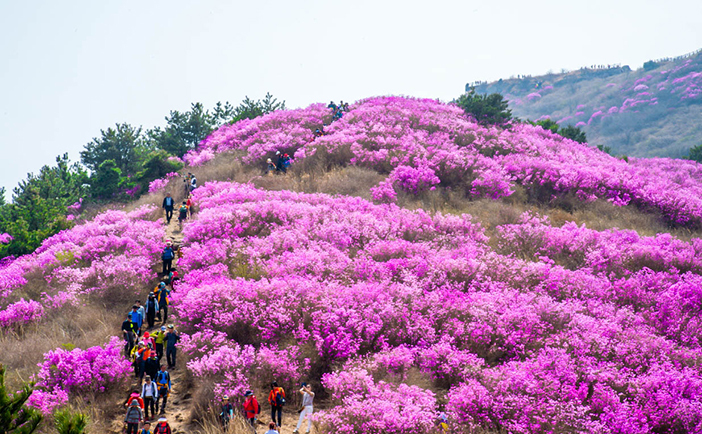 The Yeongchwisan Azalea Festival is held annually in early April to celebrate spring. 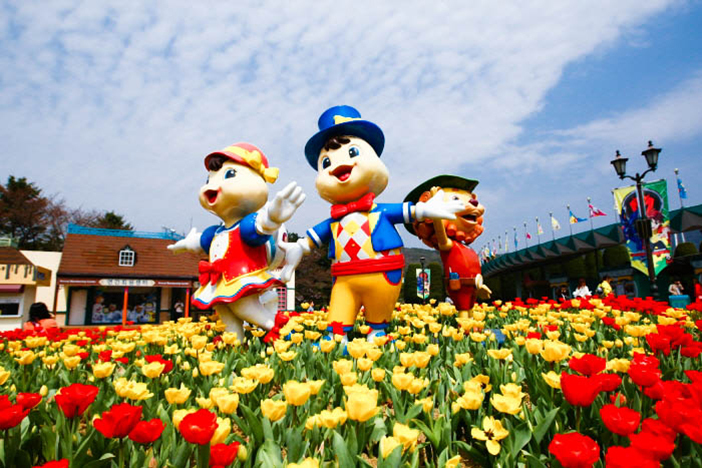 Every spring, Seoulland holds the annual Character Flower Festival, offering much to see and enjoy. Colorful flowers decorate pathways while various cartoon characters greet visitors. Stunning flowerbeds and lively characters provide excellent photo opportunities, including that of themed anniversary photos. In addition, special light fixtures highlight the flowers at night, creating a spectacular night view. 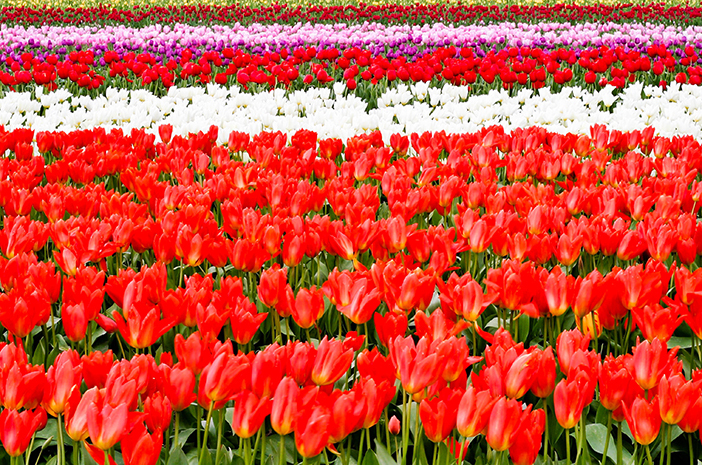 To mark the arrival of spring every year, an annual Tulip Festival is held at Everland. In addition to Everland's tulip and rose gardens, the whole park is decorated with azaleas, forsythias, camellias and freesias. There are many photo spots set up for visitors to capture their time at the festival. Guests can also enjoy events such as parades and performances. At night, the flowers are illuminated with colorful lighting displays. * This column was last updated in February 2019, and therefore information may differ from what is presented here. We advise you to check details from the official websites before visiting.